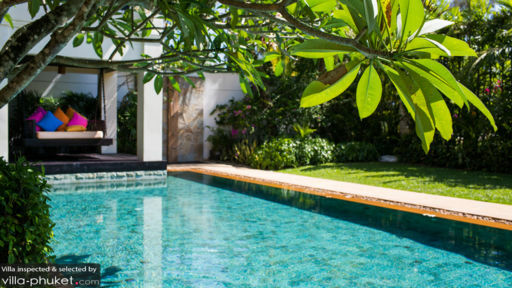 Villa Salafa’s proximity to Bang Tao Beach, gorgeous lush green garden, six spacious bedrooms that caters to everyone, even to those of limited mobility, make it the perfect getaway for large groups of family and friends. You even have a chef and your own private car to take you to some exciting spots on the West Coast of Phuket. You can truly live in luxury here at Villa Salafa. Villa Salafa has six spacious bedrooms. The master bedroom is fit for those who like living in luxury: there’s a king size bed, dressing room, en suite bathroom, a private writer’s room, and a balcony with a beautiful view of the Andaman sea. The second bedroom features a king size bed and private balcony. The third bedroom has a king size bed as well as a double sofa bed. The fourth bedroom, located on the ground floor, has wheelchair access and is designed for those with limited mobility. The ensuite bathroom has a power hoist and the room also has two electric powered single beds. The fifth and sixth bedrooms have two single beds each. All the guest bedrooms also have en suite bathrooms and most feature a view of either the sea or the garden. Enjoy the spacious garden with its palm trees and lush foliage from the number of lounge options by the poolside. There are swing sofas, cushioned chairs, pool loungers, and even an outdoor dining table from which you can soak in the peaceful atmosphere. Take a dip in the large blue swimming pool or take a short walk over to Bang Tao Beach where the sand is fine and the sun is warm, perfect for lazy days when you want to get a tan and soak up the sea breeze. With beautiful wooden furnishings and views of the lush garden area, you can sit back on any one of the comfortable sofas or watch some TV in the lounge area. For dining, enjoy a delicious meal cooked by the villa’s chef whilst seated on cushioned dining chairs overlooking the garden. 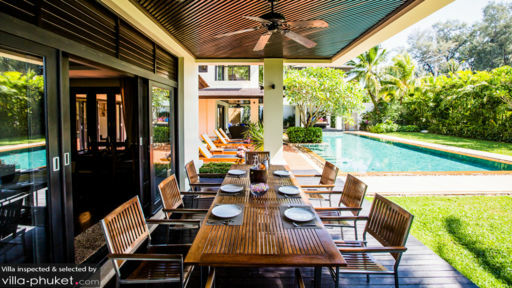 In the evenings, enjoy dining alfresco in the eight seater dining table right by the poolside. You’ll instantly feel the warmth and friendliness of the villa’s staff once they welcome you in. The villa’s chef will prepare you scrumptious daily breakfasts and meals, you won’t have to go out looking for more. The villa also offers guests a private car to help you get around Phuket. Whatever your needs may be, the staff at villa Salafa will strive to make your stay at the villa feel like a second home. Phuket is a dream destination for a number of travellers. 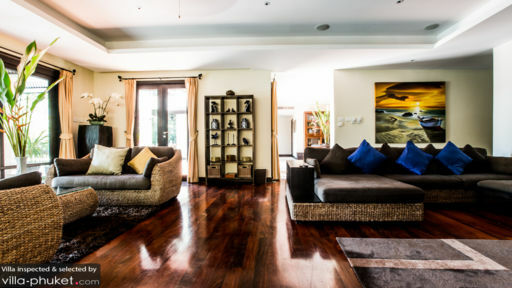 Villa Salafa, located on the West Coast of Phuket, affords guests a quiet relaxing spot away from busier areas. It’s relatively near Bang Tao Beach where you can enjoy a fun day out in the sun with your family and friends. In the evenings, there are also a number of spots you can visit for a nice drink such as the Dream Beach Club on Layan Beach and Nikki Beach Club Phuket where you can enjoy live entertainment. While the villa itself is relaxing, guests can also visit Banyan Tree Spa Phuket for a nice massage.